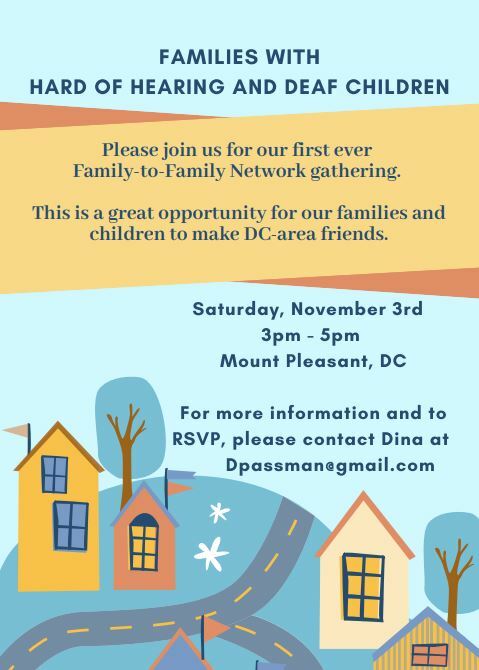 The Washington DC metro area has a plethora of resources for families. We will be spotlighting a few of these resources over time so families can be aware of outlets that are available to them in order to understand they are not alone in their experiences. “The Network was founded in 2013 by Hendi Crosby Kowal, 11 years after the birth of her oldest daughter was identified with a profound hearing loss as a baby. Her goal for the Network was to establish a peer support network among families with children recently identified as deaf or hard of hearing, by providing the opportunity for families to meet others who have experience raising children who are deaf or hard of hearing. See the picture below and be sure to RSVP for more details. Spread the word!